The Great Canadian Meat Company produces one of the largest lines of meat snacks in Canada. Well known for their dry pepperoni, beef jerky and now introducing their new line of Kurtzi’s deli salami. Affordable and convenient coffee solutions for your store, office or workplace. Folgers brand has a long history of delivering quality and flavour. Slush Puppie is a non-carbonated iced slush drink enjoyed around the world by young and old alike. We stock cups, lids and straws. Ask about the many fun flavours to choose from. We are able to supply you with your customer’s favourite brands of candies, chocolates and cookies. Nature Bounty Candy’s taste great, look great and sell quickly. 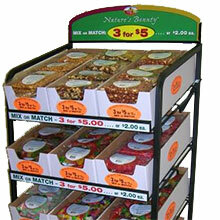 Create a colourful display with an assortment of chocolate, candy and nuts. Stands are available upon request. A Canadian company importing international brands of confectionery and baked goods including a line of NO Sugar added candies. Copyright 2015 · West Coast Distributing. Design by David Gagne.